This is Russell’s 30th year in homeopathy, having first joined the staff of the Glasgow Homeopathic Hospital in February 1986. 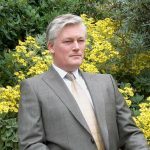 His interest in the teaching of homeopathy has evolved through the trials and tribulations of several posts and positions including: Directorship of the Education Department at RLHIM for six years, and extended periods of collaboration with the University of Newcastle-upon-Tyne, Arizona University and New York Medical College. Russell gives regular summer schools in the Czech republic and returns to Japan this year, following a successful masterclass in 2015. His clinical time is divided between the NHS Homeopathy clinic in Dundee and private practice. He likes to perform/teach opera in the evening/weekends, tinker with vintage recording equipment and sample fine French wines – when his wallet allows.